On this date in 1945 the Roosevelt adminis­tra­tion appointed Gen. Douglas Mac­Arthur Com­mander-in-Chief U.S. Army Forces Pacific (AFPAC), respon­si­ble for all Army and Army Air Forces units in the Pacific Thea­ter excepting Maj. Gen. Curtis LeMay’s Twen­tieth Air Force based in the Mari­anas. At the same time Adm. Chester W. Nimitz became Com­mander-in-Chief, United States Pacific Fleet (CINCPAC). These moves were part of the pre­pa­ra­tions for Opera­tion Downfall, the invasion of Japan set to begin in October 1945. MacArthur, who was recalled to active duty in June 1941 to mobi­lize the Philip­pine Army, was appointed Supreme Com­man­der of the South­west Pacific Area (SWPA) upon its crea­tion in April 1942. (SWPA was one of three areas in the Pacific Theater; the other two were Pacific Ocean Areas (POA) and the South­east Paci­fic Area.) From that post Mac­Arthur moved on to head the Allied occu­pa­tion of Japan (1945–1951). Ten days after the Japanese surprise attack on U.S. mili­tary instal­la­tions at Pearl Har­bor, Hawaii, Nimitz was appointed Com­mander-in-Chief, United States Pacific Fleet (CINCPACFLT). In March 1942 Nimitz was ele­vated to Com­man­der-in-Chief, Pacific Ocean Area (CINCPOA), which placed all U.S. and Allied air, land, and sea forces under him. On Decem­ber 15, 1944, President Franklin D. Roosevelt appointed Nimitz to the rank of Fleet Admiral of the United States Navy, a five-star rank only established the previous day by an Act of the U.S. Congress. In the last fourteen months of the war, Nimitz’s Fleet Forces inflicted a deci­sive defeat on the Japa­nese in the Battle of the Philip­pine Sea (June 19–20, 1944); captured Sai­pan (June 15–July 9, 1944), Guam (July 21–August 10, 1944), and Tinian (July 24–August 1, 1944); and secured in rapid suc­ces­sion Peleliu (Sep­tem­ber 15–Novem­ber 27, 1944), Angaur (Sep­tem­ber 17–Octo­ber 22, 1944), and Ulithi (Sep­tem­ber 1944), which became the undis­closed Pacific base for major naval oper­a­tions late in the war. In the Philip­pines his ships scored an his­toric vic­tory in the Battle of Leyte Gulf (Octo­ber 24–26, 1944). Nimitz cul­mi­nated his Pacific stra­tegy by suc­cess­ful am­phib­i­ous assaults on Iwo Jima (Febru­ary 19–March 26, 1945) and Okinawa (April 1–June 22, 1945) and an aerial assault in late March and April 1945 on the Japa­nese Home Islands with the mining of vital sea­ports, straits, and inland water­ways using B‑29 Super­for­tresses dispatched by LeMay’s Twentieth Air Force (Oper­a­tion Star­va­tion). The late-in-the-war mining campaign crippled Japa­nese mer­chant shipping and troop move­ments, destroying or damaging 670 ves­sels. Had the mining operation begun earlier, in a July 1946 estimate from the U.S. Strategic Bombing Survey, the Pacific War might have ended sooner. When Japan’s armed forces and the forces under its control for­mally sur­ren­dered on Septem­ber 2, 1945, on board the USS Mis­souri in Tokyo Bay, Nimitz was there, signing for the United States of America. The twenty-three-minute surrender ceremony was broadcast around the world. 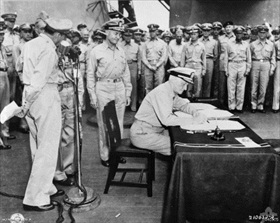 Left: Japanese surrender aboard the USS Mis­souri, Tokyo Bay, Sep­tem­ber 2, 1945. Adm. Chester Nimitz signed the Instr­ument of Sur­render for the United States. At the micro­phone is Gen. Douglas Mac­Arthur, Supreme Com­mander for the Allied Powers, who accepted the Japa­nese sur­render “for the United States, Republic of China, United Kingdom, and the Union of Soviet Socialist Republics, and in the interests of the other United Nations at war with Japan.” On Septem­ber 7 the sur­render docu­ment was presented to Presi­dent Harry S. Tru­man in a formal White House ceremony and then placed on exhibit at the National Archives. 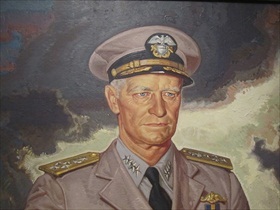 Right: Adm. Chester Nimitz as he appears at the National Por­trait Gal­lery in Wash­ing­ton, D.C. Nimitz was one of only four Fleet Admirals in the U.S. Navy. A Fleet Admiral takes orders only from the President of the United States, and it is a life­time appointment.